Del presents a number of excellent staff development programs for Residence Life and Housing Staff. These programs are designed to assist your RAs and Hall Directors in fulfilling their paraprofessional roles, and help them to work with their students more effectively. If you are planning a half-day or full-day training program for your Res Life staff, you might also want to consider Del's programs in Leadership Development and Student Activities. All of these areas overlap, and you may find the perfect programs for your staff listed under those programs. Del is pleased to announce his latest innovation-- Instant Assessment!TM At the end of each program, students can complete an online assessment tool by using their smartphone, iPad/tablet, or computer. The results will be available immediately, and can be provided to you as an excel spreadsheet and in graphic form complete with statistical analysis. No more tabulating paper surveys and evaluations! Knowing what changes will occur in students-- when those changes will occur, and what they will be-- is the core of Student Development Theory. Serving as a "crash course" in psychology, this presentation covers the basics of Chickering, Perry, and Maslow for RA's, Directors, and other staff in Residence Life and Student Life. Student Development Theory is a remarkably powerful tool for staff working in Residence Life. This presentation will provide useful insight into your students' personal development, enabling your staff to better understand your students, to anticipate their needs, and foresee some problems before they occur. Residence Assistants and Residence Directors are typically charged with presenting a number of programs for their floor and hall. This session is an interactive presentation, designed to produce at least sixty free or inexpensive ideas for events and programs! Over the course of an hour, we'll generate program ideas for various topics, seasons, holidays, and more. If your RAs need program ideas, then this session is for you. Team building programs have traditionally taken a physical approach... but not every location has the capacity for a ropes course or other physical program. Del has created a team building program that helps your students understand the intellectual concept of team work while simultaneously completing team bonding exercises. This program was first developed by Del for college athletic teams, and proved so successful that he has transformed it into a student leader team building. Burnout: a state of mental, physical and emotional exhaustion. When the alarm clock goes off, do you hit the snooze button and roll back over? Does your life and job remind you of the film "Groundhog Day"? At one time you were excited about your job and eagerly embraced each day. Wouldn't you like to keep that enthusiasm alive-- or bring it back to life? This session may be the answer. 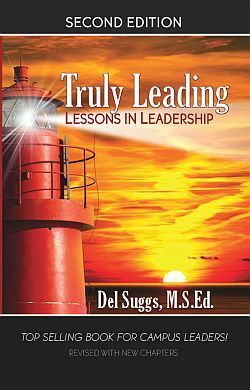 Del Suggs, noted Leadership Development trainer, author and APCA "Best Campus Speaker" will inspire you with this quick lesson in Attitude Restoration. Learn to recognize burnout in yourself, and some simple steps to regain the joy in your life and work. You see your students thumb-typing like crazy and wonder what's the big deal? Not after this presentation. It's like this: students are totally comfortable in the sea of technology, while staff and faculty are trying to learn how to dog-paddle. This session will explain what social networking is, and help you understand the most popular sites Facebook and Twitter. If attendees have notebook computers, and wi-fi is available, then Del can assist staff and faculty in setting up their profiles. Here is a chance to catch up, before you get any further behind. It's perhaps the most common missed opportunity on any college campus. While campus entertainment should be fun, it can also be culturally enriching, or have an educational slant. But more importantly, programs can serve to reach across campus and bring students, faculty, and staff together. You often hear those common buzz-words among the administration on campus, words like "campus community," and "experiential learning." The programming staff on your campus-- whether it's Student Activities, Student Life, Student Involvement, Student Leadership-- can truly be the key to campus collaboration in learning. This program discusses various ways to integrate student activities into the teaching/learning mission of the school, and seek to facilitate a true campus collaboration. Non-traditional schools have a difficult time meeting the programming needs of their students. It can be an exercise in frustration to present wonderful events in empty rooms. This session will discuss the differences in programming for non-traditional schools: without residence halls, older (or mixed age) student populations, "suitcase colleges" and more. We'll also come up with useful strategies to meet the program needs of these students. For programs presented over multiple days, please add $500 for each additional day plus accommodations.